This is a yearlong course divided into two semesters. 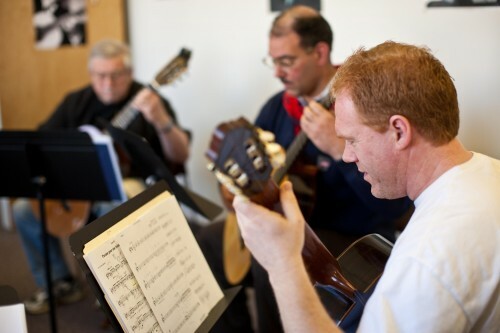 Seeing other students play, and making music with them is enriching and fun and an extraordinary opportunity for guitar students to develop ensemble playing skills. Students in these classes develop note-reading and aural skills, in addition to practicing instrumental techniques. Permission required. Please email lmcgrath@esm.rochester.edu. Placements will take place Sunday, June 2. Please check back soon for more information. Continuing ECMS students may re-register online from May until September. Once registered, students may begin attending classes. The only registration confirmation you will receive is your bill. You may log on to check your registrations at any time. Click here for complete details on registration and policies.